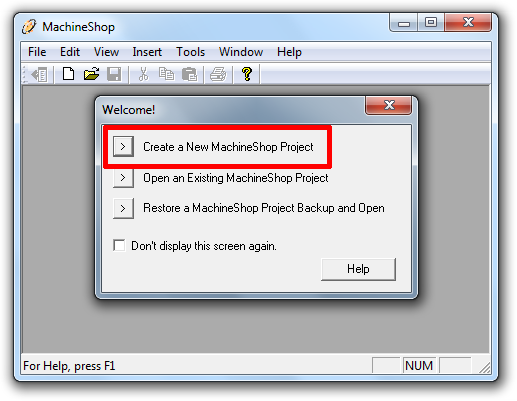 For this method, you will need a laptop/desktop with MachineShop Suite installed on it. While uploading and downloading applications does not require a license, you will need one if you intend to do any editing of the application. This method will allow you to deploy or retrieve your InteractX application over a network without being physically near the HMI. It can also be help developers avoid additional labor and hassle during their design/test cycle. For this to work, your HMI will need to be connected by Ethernet back to your PC. This can be done using a variety of network topologies. The simplest connection is one from the HMI directly to your PC. Different topologies are described in brief below. One Ethernet cable between the HMI and the development PC is the simplest network topology and the easiest one for a newcomer to set up. A slightly more complex topology is one with a switch between the HMI and the development PC. This one is still easy to use, but it should be noted that the switch is a possible point of failure. It is possible to deploy InteractX applications over a corporate network from a development PC to a plant floor HMI; many customers do this. This brings the additional complication that the two units must both have access to the network and be properly configured to see each other. If you want to deploy InteractX applications in this way, speak with your IT department early on so that the HMI can be given appropriate rights on the network. Deploying InteractX applications over the Internet is unreliable and risky. Connection issues over the Internet can easily cause download failures and the download process opens an unprotected security hole in the network through which the download occurs. As such, this method is not supported. Users who need to do remote maintenance on InteractX HMIs are advised to run a remote desktop viewer and remote in a local development PC. Open MachineShop Suite on your development PC. You should see something similar to the image below when it starts up. Click Create a New MachineShop Project. If you do not see this dialog box, you can also create a new project by clicking File > New Project. Give your new project a name and click OK. 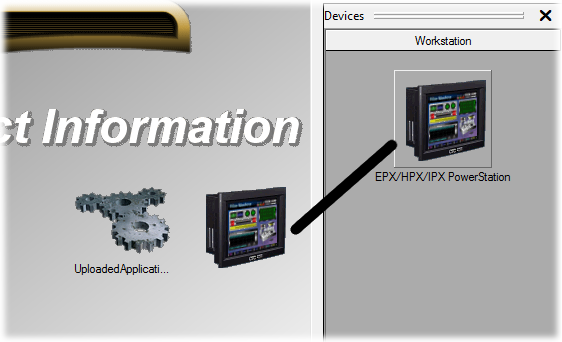 In the upper right-hand corner of the screen, there should be an icon labeled EPX/HPX/IPX PowerStation that looks like an HMI. Click and drag that icon into the main project workspace next to the icon that looks like three gears. When prompted, give the device a name and click Next. You should now see the Connections dialog box. Click Add. 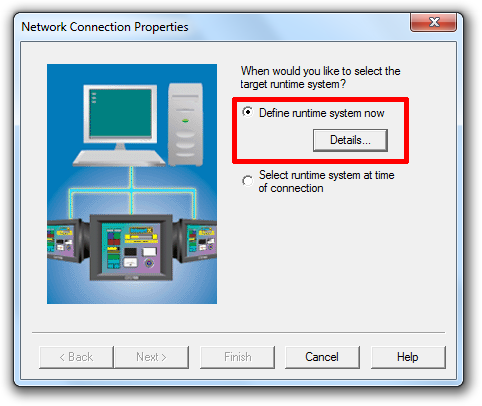 Then, give your connection a name, set the type to Networks, and click Configure. 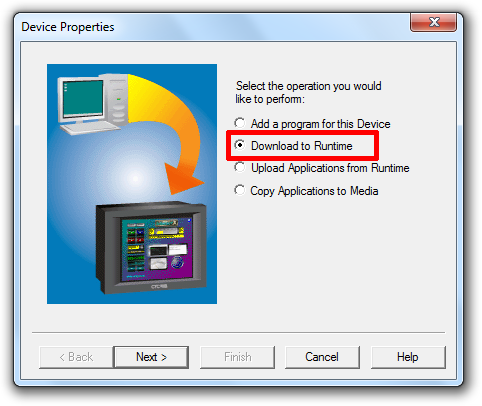 Select Define runtime system now and click Details. You can choose to define the connection based on the IP address of the InteractX HMI or its name. 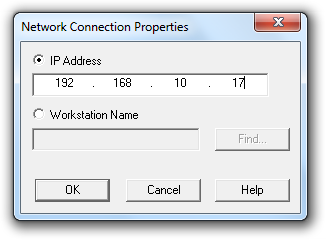 If your HMI has a static IP address, you can use it to set up the connection. This is usually best when the network is small and only consists of a few devices. 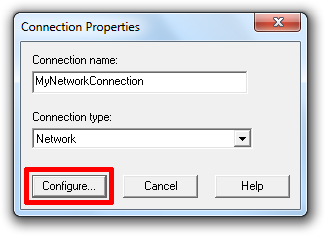 If you are transferring an application over a company network with dynamic IP address assignment, you may want to set up the connection based on the PC name. 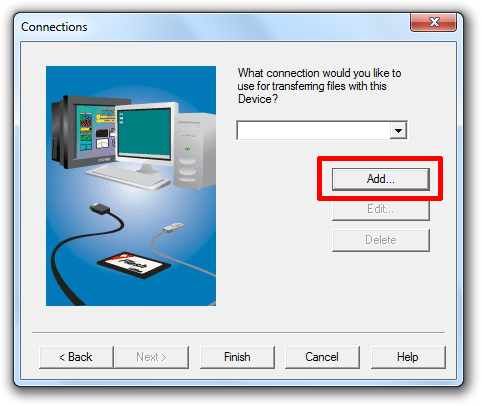 After entering either an IP address or a PC name, click OK.
InteractX supports the use of a username and password for upload and download access. 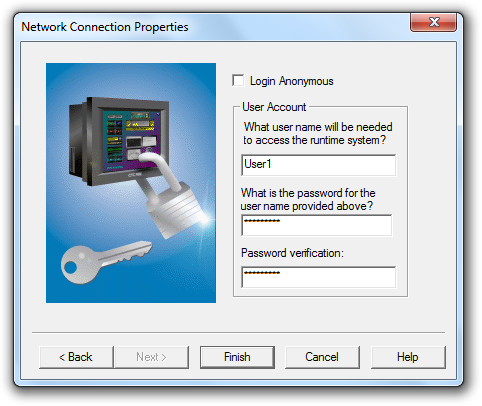 If your InteractX HMI has a username and password configured for it, enter them in here. If it does not have a username and password, check Login Anonymous (click here if you are not sure). After that, click Finish. NOTE: The default setting on the HMI is Login Anonymous. We are now ready to upload the application. In your project workspace, double-click the HMI that you dragged onto the screen earlier. 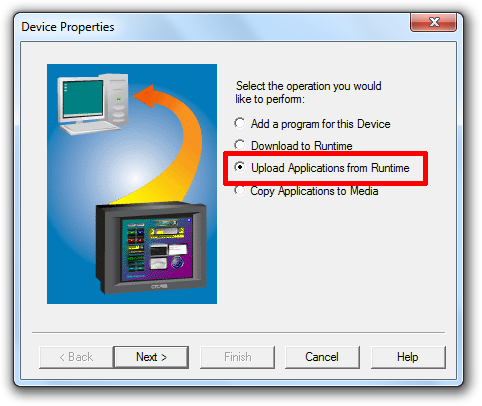 In the dialog box that appears, select Upload Applications from Runtime and click Next. 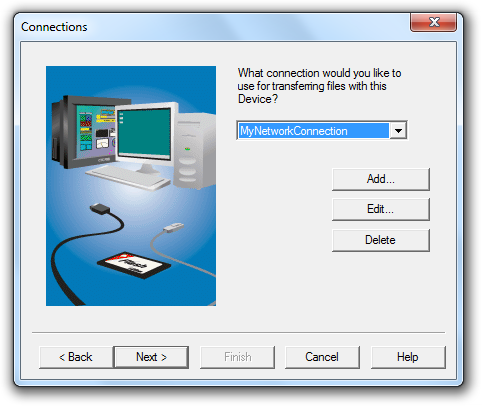 On the Connections dialog, click Next. Then, click Finish. You will be prompted to overwrite existing applications; click OK. MachineShop Suite will verify that the upload was successful. You should now see the application at the bottom of your Project Browser on the left and can open and edit it by double-clicking it. NOTE: This is a good time to save the project so that you have a backup copy. Click File > Backup Project to save a backup copy. NOTE: Users who are uploading an old application into a newer version of MachineShop Suite may be prompted to upgrade their application. It is important to create a backup of the application before upgrading it as the upgrade process is not reversable. An application that has been upgraded to a higher version of InteractX cannot run on an HMI running a lower version of InteractX. You now have an InteractX application that you can edit or deploy onto another HMI. Now that you already have a Disk Connection set up for this application (see Step 3 in the previous procedure), deploying your application to an HMI is a simple process that is essentially a reversal of the previous one. The steps are given below. Double-click the HMI object in your Project Workspace and select Download to Runtime. Click Next. Select the connection you used to upload the application, then click Next. Check the box labeled Application Files. 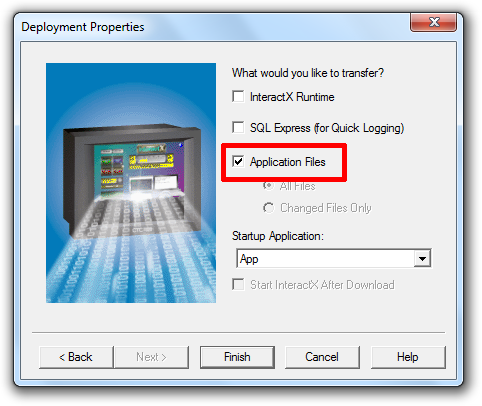 Do not check the box labeled InteractX Runtime or the box labeled SQL Express (for Quick Logging). Click Finish. The application will download to the HMI and MachineShop Suite will tell you when the process is complete. NOTE: If you have also read the FAQ about downloading applications using a USB stick, then you have probably realized that downloading over Ethernet has fewer steps. Because of this, we recommend that regular users of InteractX use the Ethernet download utiliy as it will save them time. There are things to keep in mind when performing upload and download operations over Ethernet. A few of them are summarized below, but this list is not comprehensive, especially for corporate networks. For a download to work, the Deployment Server must be running on the HMI. InteractX will not allow you to transfer an application if your username and password are incorrect or if your unit does not allow anonymous login. You can change the username and password (or remove it) on the HMI using the Deployment Server. On your HMI's desktop, click or right-click the bowling ball icon in the taskbar. In the option panel that appears, click Network. Here, you can set the username and password. Press an Exit button in the application. On a keyboard, press Alt+F4. On keyboard, press Ctrl+Alt+Delete. From there, open Task Manager and kill the HMIRun.exe process. If none of the above options work, call 707-584-7558 or email emn_support@parker.com. If you are connecting using a static IP address and it is not working, try sending a ping command to see if that address is reachable from your PC. If it is not, you may have an IP address or a subnet mask configured improperly. PCs that have Gigabit LAN ports can typically use either crossover or straight-through Ethernet cables when communicating with any other device. This is because the Gigabit standard requires crossover auto-detection. However, older PCs may only support 100 BASE-T and may not offer auto-detection. You can always check to see if the physical connection is good by looking at the lights on the Ethernet port. If they are on or blinking, the electrical connection is fine. If they are not, try using a different cable or adding an Ethernet switch to the system.